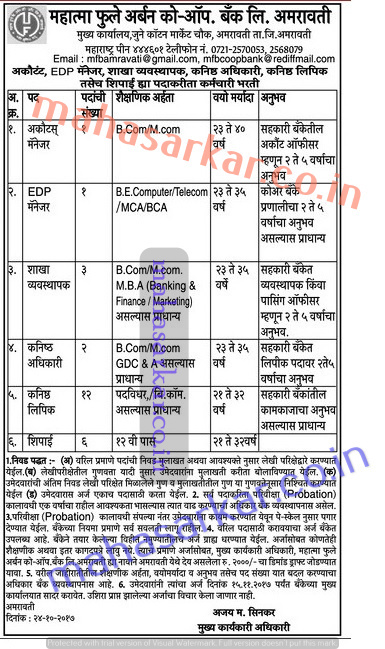 Mahatma Fule District Urban Co-Operative Bank (Mahatma Fule District Urban Co-Operative Bank Ltd), Amravati Published Job Notification for 25 Accounts Manager – Branch Manager & More Posts. Candidates who wish to apply must look at Mahatma Fule District Urban Co-Operative Bank Recruitment 2017. Eligible candidates can apply offline before 15-11-2017. Education Qualification: B.Com/M.Com/BE/MCA/BCA/Graduate/12th Pass and More. For Post wise Education Details follow the detailed advertisement. Interested & Eligible candidates can send their application along with all the necessary documents and testimonials to Mahatma Fule District Urban Co-Operative Bank Ltd., Juni Cotton Market Chowk, Amravati – 444601. Starting Date, Last Date to Apply Offline at Mahatma Fule District Urban Co-Operative Bank Ltd which candidates should be remember as follows. Start Date to Apply Offline: 25-10-2017. Last Date to Apply Offline: 15-11-2017.